The Creators are, presumably, those responsible for the bizarre social experiment going on, and the deadly maze-like conditions found outside of the “Glade” where the boys have established their own quasi-civilization. Thomas promptly proves to be an unwitting herald for “the end” of life as they boys have come to know it. The story started out at a very readable, rapid clip, with well executed action scenes that carried things steadily forward. Thomas is a bit bland, but not unlikeable...and you tend to give him a break over the whole mind-wipe thing. (Maybe it did a number on his personality as well—who knows?) Not until the middle did things begin to sag. Up until then, it was relatively easy to ignore things like the pointless secrecy (Wait...why can't anybody just give a quick summary and debrief the new guy so he doesn't screw everything up out of ignorance? ), or the total lack of backstory on the main and side characters. A lone female character is introduced, which did shake up the social landscape a bit—but not as much as I would have expected. She seems important—and when you finally figure out why—it only generates more questions as to the point of...well...everything. Also...token girl is kept unconscious and out of the action for the majority of the book. The plot picks back up again as it races toward a finish that...well...still doesn't make a lot of sense to this reader. Now I'll admit, I picked this up with eyes wide open. I knew the story had to stretch out across at least four existing books—so that meant a likely cliffhanger. I can live with that. What makes me hesitate to pick up the next in the series is the looming impression that most of my world-building questions will either go unanswered, or be chalked up to crazy people doing crazy things. Guaranteed to keep you reading! Hold on for an exciting trip to a mysterious world where remembering might be a key to returning home. The only thing Thomas can remember when he wakes up in the lift is his first name. Nothing else. When the lift opens he finds he's not alone. Other boys greet him to the Glade, which is enclosed by stone walls. The other boys don't remember much either, only that they have to make sure they're not out at night in the huge maze that encircles them. A dangerous creature waits for them. That is if they're lucky enough to survive the string. Every night, for the past two years, the walls close tight at night. Every thirty days a new boy comes to them in the lift. That is until now. A girl comes in the lift muttering a strange message. The arrival of the girl brings back snatches of memory to Thomas. Somehow the Glade seems familar. So does the maze. All Thomas needs to do is remember so he can find a way back home. This is a great fantasy that reminded me of THE CUBE meets LORD OF THE FLIES. A sure page turner, each scene builds up to the final confrontation at the end. Thomas knows he's different somehow from the other boys trapped inside the maze. His struggles to break through his blocked memories, as well as his attempts to understand the maze pull you right into the story. I wanted to know why Thomas was sent to this place and also why a series of events were released with his arrival. I only wish I'd known more about the mysterious girl, that has a link to Thomas. But I'm sure the author will reveal more of that in the sequel. The setting is intriguing. So is the premise of bringing boys to an unique world as part of a twisted experiment. Glimpses of their other lives are revealed with other questions. All these tie in with the mystery of what is the maze and if they can indeed escape. Sure to appeal to fans of THE HUNGER GAMES, this tale will keep you reading until the end is revealed. And even then the teaser last page will have you guesting. Be prepared to be glued to this unique tale that won't release you until the very end! Nice story that unfolds really fast, and in an interesting way. I enjoyed this first part to the trilogy. The opening reminded me of Target Earth (1959). Good idea. Great book for inspiring writers! 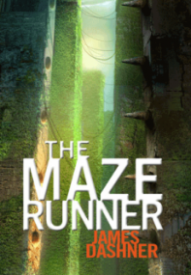 This fabulous story written by James Dashner features a cast of young teenagers living in a place where they are constantly looking for a way out, whilst trying not to be killed. The plot is like a refreshing drink on a warm summer day; you just have to sigh with relief once you've gulped it down. Inspiring piece of work; budding writers should read this to learn how a great plot and writing style, character creation and how to keep a good story going. Pat on the back for James Dashner! enough unique aspects to keep it interesting. It's worth your time to read it. The Maze Runner By James Dashner was an action packed medium paced book. The book starts off with the main character Thomas arriving in a metal box with absolutely no idea of what happened to him before. He is than welcomed by a group of boys to a small little society that's enclosed from the outside world called the Glade. After being shown the rest of the glade Thomas realized that he wont be leaving the glade anytime soon. Since it is closed off by huge chunks of wall called the maze that surround the glade. Now since hearing of this book I was quick to put it a side as it did not capture my interest whatsoever, just seemed like another version of the Hunger Game which I had already read. But after given it a second look, I could not put it down. I would recommend this to anyone who liked the Hunger games and the Divergent series. With a mysterious opening, I was hooked from the very first page unlike many other books. James Dashner [AUTHOR] was clever in the way of making sure the reader became intertwined within the mind of teenage boy, Thomas. Just like Thomas, we had no idea what was going on, and being thrown into the center of a chaotic labyrinth was just the first thing we knew! As we are greeted by other members of this unforgettable bundle of confused teens, we find that they, just like Thomas, have no clear memory. Almost every single character is memorable, and even when something situates between characters you don't know that well, you still find your eyes glued to the pages! Throughout the book, I feel that James Dashner's writing improved from the first half, which somehow made the tension towards the end better than it could ever have been. I definitely recommend this book (and the rest of the series, including the prequel) to any fans of The Hunger Games trilogy, the Divergent trilogy and anyone who has a general interest into the fictional worlds of Dystopia!